"The Epicenter of Texas High School Football "
Capacity: 17,931,standing room only tickets available for high profile games in the end zone brings the capacity to 19,500. There are usually 1 or 2 "high profile" games a season. The Odessa Permian vs. Odessa High Game and if played at Ratliff, The Odessa Permian vs. Midland Lee game. Directions: From I 20 go north on East Loop 338 to Yukon Rd.Turn left (West), you can't miss it because its big, it's well lighted at night and there is nothing else there. 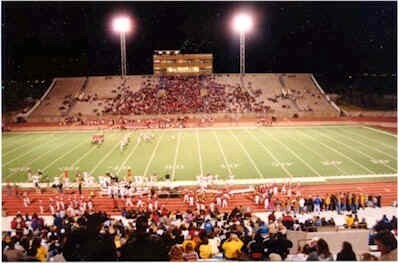 Update: In October 2001 USA Today picked Ratliff Stadium as one of the top 10 High School Football Stadiums in the U.S.
A Fall Friday night in Odessa, Texas can only mean one thing, Texas High School Football. 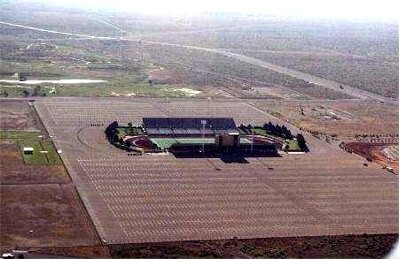 Texas High School Football is great anywhere, but in Odessa they play in a venue that has been called the "Epicenter of Texas High School Football". 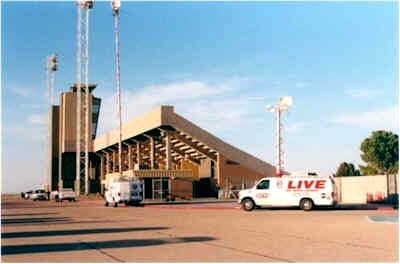 Ratliff Stadium is a great place to watch football and the home field of the Odessa High School Bronchos and the Odessa Permian Panthers. Tonight's game pits the Eagles of Abilene High School against the Bronchos of Odessa High School. These are two of the oldest high schools in West Texas and have been playing each other since footballs were made out of real pigs and helmets were nothing but thin leather bonnets. But tonight these boys will play with Reddell on the front of their helmets and some science experiment called "turf" under their feet.Any game played in this district (2-5A) is good but any game played at Ratliff is special. We arrived at the game early (I always arrive early), at least 1 hour before the kickoff. This gives us time to check out of "Football Fan" equipment and see if we have what we need. Let's see, stadium seats, those aluminum benches can be cold; binoculars, great if you watch the game from the top of the stands the way I do and they come in handy when trying to find your car. Did you see the size of that parking lot? Cold weather gear, fortunately tonight's weather is perfect requiring only a light jacket. The weather and wind can be brutal in West Texas. Be prepared. First I drove around the parking lot to see the preparation and activity going on around the stadium. The Abilene fans were there early too, Abilene is a two and a half hour drive away and this was the second week in a row that they have played at Ratliff. Two local TV stations were setting up live trucks for the local sports feed back to the station at 6:00 and 10:00. Ratliff is totally wired for television. All games are rebroadcast on public access channel in the Midland / Odessa market on Sunday afternoons. Occasionally play off games are broadcast live. The bands and football teams arrived so we head for the ticket window. The ticket booths were a little late in opening but when they did all five windows were doing a land office business. At Ratliff all seats are reserved except the student sections so its a good idea to have an idea where you want to sit. For the really big games the ticket booth may never open. Most of those tickets are sold days before the game and many times after standing in line all night. My estimate of the crowd on this night was about 9,000. That gave us enough room so after the game started it was easy to move around and get the seat you wanted. The Odessa High "Marching Red & White" march out and did a pre-game show then played the "Star Spangle Banner". (The Henry Fillmore arrangement) Everyone in the stands sang along. Isn't amazing how much better it sounds than it use to? The game was great. How great? You'll have to find out for yourself. In a minor upset Odessa beat Abilene 13 to 10. Of course Ratliff is the home of upsets. Last year Odessa High beat Midland Lee in Ratliff. Midland Lee went on to win the 5A Division 1 State Championship. Odessa High? Just another great season at Ratliff Stadium.